My Taijutsu instructor in the UK, Marc Moor, is prone to waxing lyrical as he casually flings unsuspecting young men to all four corners of the dojo; between the grunts of his victims and the dull thud of bodies ricocheting off walls, he quotes wise men, great men, powerful men, ancient warriors. Shrek: Example? OK, er, Ogres are like… Onions! Shrek: Yes – No! … Onions have layers! Ogres have layers. Do you get it? We both have layers! 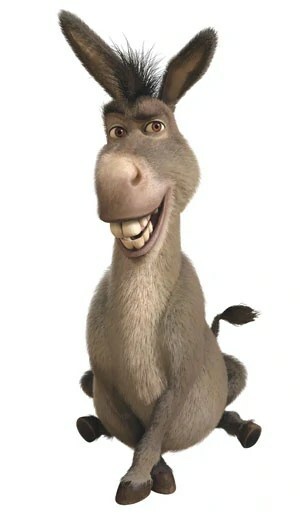 Donkey: Oh, you bith have layers. You know not everybody likes onions. Um, cakes! Everybody loves cakes! Cakes have layers! I’ve been getting this Qi Gong thing wrong, you know. I was going through the form thinking, because it looks a bit like Tai Chi, that the movements were supposed to be carried out in similar fashion. It turns out that the opposite is true. As you bend and stretch, as your arms glide across and up, as you compress and extend, your body should actually be in tension most of the time – relaxing only in between breaths and / or movements. Having made this seemingly small correction, a whole new field of play is opened up to me, and I am put in mind of Mark, Shrek and, of course, Donkey. I’m finding three levels of complexity to Qi Gong at the moment, as a beginner studying the Yi JinJing (literally: Muscle & Tendon Changing) form; the original form devised by the Shaolin Monks to create bodies that were hard, supple and powerful enough to deliver what their near-superhuman martial art asks of them. These are the layers of the onion (or cake), as I see them. There are many more, but a beginner’s eyes see only simplicity, and so this is all I can share. The first thing to get right is the actual physical movements of the form. There are around a dozen movements, all symmetrical, performed on both sides to ensure balance. Some are easy to perform (arms out to the side, arms out front – arms behind the ears, arms up in the air) and some are… not (twist to one side, create a kinetic wave up your spine and down your arms to put your whole body’s power behind a strike – bend your torso so it’s folded at the middle and your nose touches your knees). Just getting your body in the correct shapes and movements requires huge amounts of strength and flexibility, albeit with slow, graceful movements that make it all look easy. …breathing. Yes, yes, yes I know we all know how to breathe. All the time, without having to really think about it. Those of you who are reading this and are also martial artists, or dancers, are probably smugly thinking ‘yeah yeah I know all this, I know how to breathe properly’ and to some extent you’d be right. I mean God knows I can’t dance but I do have about ten years of martial arts under my belt, and thought I knew a bit about creating rhythm and power through correct and deep breathing. Turns out I know nothing, which was a pleasant surprise. In all those difficult stress positions everything I knew went out of the window, so I ended up breathing from the top of my lungs and my shoulders. Wrong. So, correcting, I began to use my diaphragm to breath, in the Samurai way. Wrong. Too easy. Breathing in Qi Gong must be completely internalised; diaphragm yes, but in a far, far subtler way than I am capable of and taking breathing to its extreme and beyond – adopting so much control that you drop out the other side – adopting so much control that you again free your breath from movement so that you can generate power at any time and in any situation. Very gratifying to see my name alongside the great philosophies of the modern age. You are becoming one with oneself. Oneness is. Cool.